Before the beautiful downtown Los Angeles Union Train Station opened in 1939, built on the site of the original Chinatown, the various railroads serving L.A. each operated from their own stations. 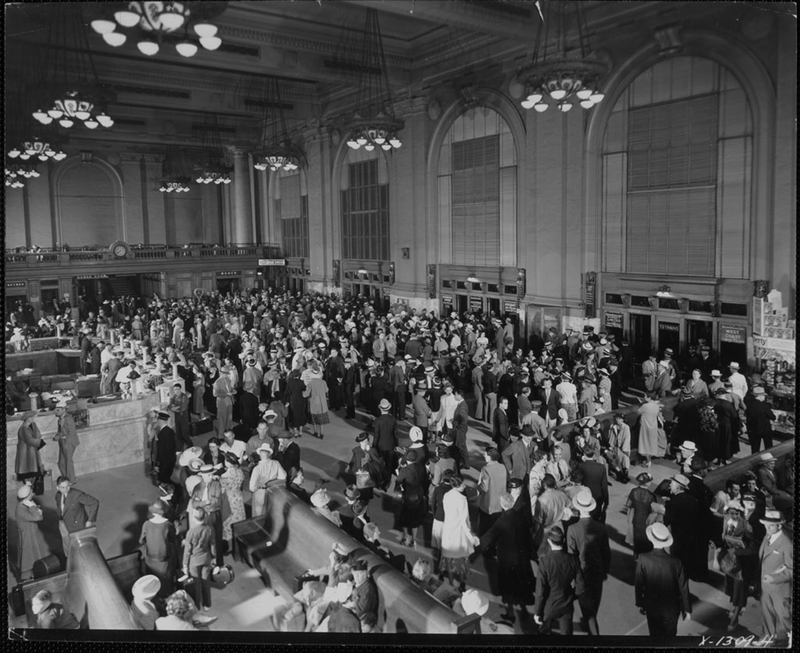 Union Station helped to reduce downtown noise and congestion by consolidating the Union Pacific, Santa Fe, and Southern Pacific city entrances and stations into a single terminal. As with so many other Los Angeles landmarks now lost to the wrecking ball, glimpses of the former Southern Pacific Depot, that once stood at E. 5th Street and Central Avenue (pictured above), are unwittingly preserved in the background of numerous silent comedies. One early appearance comes during a stunt from the Douglas Fairbanks comedy When the Clouds Roll By (1919), as Doug scampers up the Southern Pacific Depot’s front awning (above). 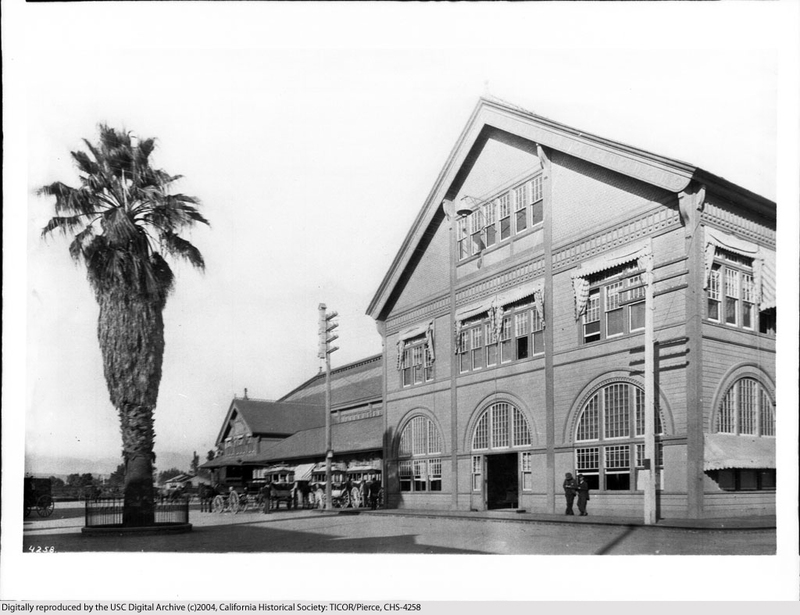 The Southern Pacific Depot opened to great fanfare on June 12, 1915. Built at a cost of $750,000 on the site of the former Arcade Depot (1889 – 1914), the Southern Pacific Depot was touted as the nation’s finest building of its kind west of Kansas City. The station was 572 feet long, with a concourse 280 feet long, by 80 feet wide and 50 feet high. Ten passenger tracks, protected by four concrete umbrella sheds each 780 feet long, were accessed by subways so that passengers no longer needed to cross tracks to reach their particular trains. 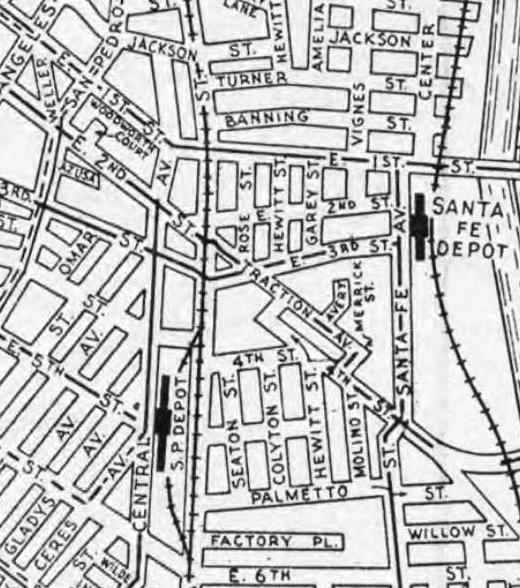 Two now lost stations – the extant Union Station, that replaced the SP and Santa Fe Depots, stands several blocks further north on this map. The Southern Pacific Depot played a key role in Harold Lloyd’s 1924 feature comedy Girl Shy. As I explain in my book Silent Visions, Harold and lead actress Jobyna Ralston are filmed arriving in town at the Santa Fe Depot on Santa Fe Avenue near 1st Street. Yet they say their good-byes to one another in front of the Southern Pacific Depot, several blocks to the west, as shown on this vintage map (left). As I may discuss in a later post, the Santa Fe Depot was a popular place to film, appearing in numerous Hal Roach Studios productions including Charley Chase’s Crazy Like A Fox (1926), Laurel & Hardy’s Berth Marks (1929), the Our Gang comedy Choo-Choo! (1932), and in Lloyd’s independently produced talking picture Movie Crazy (1932). Below, Harold Lloyd at left, in front of the Southern Pacific Depot in Girl Shy, and Stan Laurel playing a hansom cab driver in his pre-Oliver Hardy solo comedy Mother’s Joy (1923). Harold Lloyd and Stan Laurel both in front of the Southern Pacific Depot. Filmmakers not only captured the western (front) side of the Southern Pacific Depot, the south end of the station (the side facing the sun all day) also appears in vintage comedies. In Just Neighbors (1919) (see left below) Harold Lloyd races around the station corner attempting to catch the next train home, when he runs into several people blocking his way. 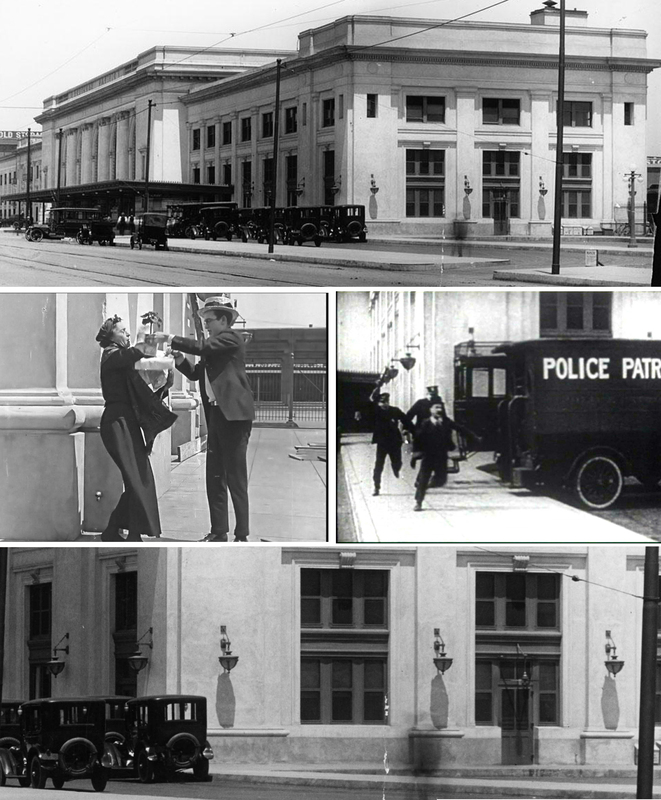 In Be Reasonable (1921), Billy Bevan (see right below) flees the police by racing south from the station during a lengthy chase, presaging Buster Keaton’s similar chase in Cops (1922). Notice the former station’s distinctive light fixtures along the corner walls. 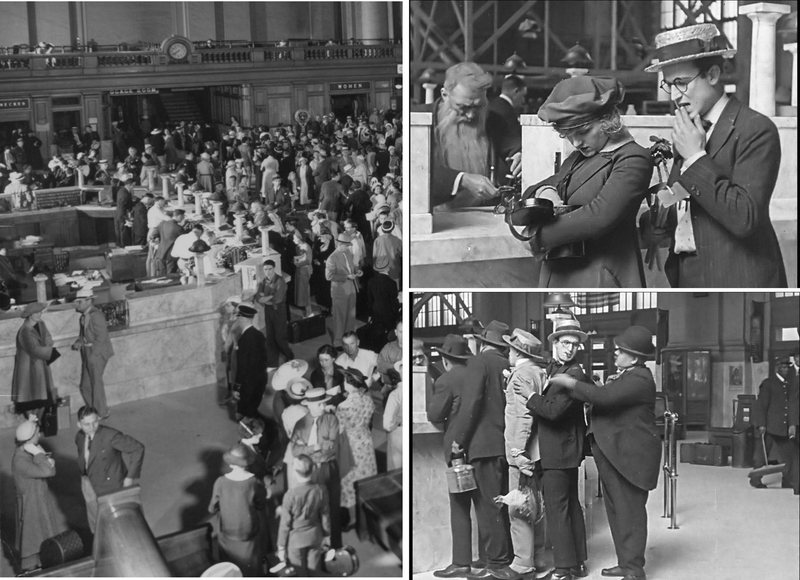 Harold Lloyd’s short film Just Neighbors also provides some remarkably rare views of the interior of the lost station. Compare this photo below, with scenes from Harold’s movie. A rare interior view of the Southern Pacific Depot – USC Digital Archive. Note: the archive credits this photo as around 1956, perhaps a typo for the more likely 1936. Click to enlarge. Harold’s ticket counter appears left center. Below, the extant Rosslyn Hotel (1913) at 5th and Main appears in the background during a scene from Girl Shy as Harold runs west after Jobyna’s taxi cab down 5th Street from the Southern Pacific Depot. In the matching modern view, the US Bank Tower, the tallest building on the West Coast, dominates the skyline. At 1,018 feet, the building stands nearly seven times as tall as the 150-foot height limit imposed in Los Angeles for many decades. I don’t think anyone involved with filming Harold’s scene could have imagined that the downtown skyline would someday appear this way. Click to enlarge. Harold runs down 5th Street from the Southern Pacific Depot – a matching modern view. Below, the cold storage distribution facility, standing on the site of the Southern Pacific Depot today, was completed in May 1958. To see where Buster Keaton filmed several movies at the Inglewood and Chatsworth depots, check out this earlier post Buster’s Trains – One Week to Speak Easily. When the Clouds Roll By (1919)—Douglas Fairbanks: A Modern Musketeer Collection (David Shepard, Film Preservation Associates, Jeffrey Masino, Flicker Alley LLC). Mother’s Joy (1923)—The Stan Laurel Collection Slapstick Symposium (Eric Lange and Serge Bromberg, Lobster Films). Be Reasonable (1921)—American Slapstick 2 Collection (All Day Entertainment, David Kalat). This entry was posted in Douglas Fairbanks, Girl Shy, Hal Roach Studios, Harold Lloyd, Los Angeles Historic Core, Stan Laurel and tagged Arcade Depot, Be Reasonable, Douglas Fairbanks, Girl Shy, Harold Lloyd, Just Neighbors, Los Angeles Arcade Depot, Los Angeles Historic Core, Los Angeles Southern Pacific Depot, Los Angeles Train Stations, Los Angeles Union Station, Mother's Joy, Santa Fe Depot, Silent Comedians, Silent Comedies, Silent Movie Locations, Silent Movies, Southern Pacific Central Depot, Stan Laurel, then and now, When the Clouds Roll By. Bookmark the permalink. So much as been lost, John. In Texas, we’ve tried to preserve our old train stations- large and small- in some manner, just as we have our old county courthouses. They’re a part of our heritage. It’s a shame that so many fine structures like the Southern Pacific Depot were arbitrarily demolished as they were. On the other hand, If Lloyd, Fairbanks or some of the other silent filmmakers had seen the present day skyline of Los Angeles (after having abruptly lept ahead a century of time) they’d have probably thought they were on another planet. In a way, they’d have been right! Fabulous information. Sad great structures were torn down. Have never seen this info put together like this. Southern Pacific brought many newcomers to L.A. as did Santa Fe. Didn’t realize the stations they arrived at were separate. There was a depot in the Valley, too, wasn’t there? Thanks so much for the info…. Hi Joanne – thank you for sharing your memories. That must have been fun tricking people into thinking they saw you twice. Hi John, thank you for all this research! I’ve been following the history of Los Angeles’ railroads all my life and I’ve NEVER seen mention of this station in all the materials I’ve come across. I knew about the Arcade Station (but had only seen one photo) as well as La Grande’s, but never this one. It just goes to show me– just when I thought I had a good, firm grasp of the railroads in Los Angeles, here’s a massive piece of the puzzle I’ve missed completely. Thanks again! Great – thanks Bob. This former SP station appeared in silent movies frequently, especially if the scene required a formal, New York type vibe. Did you see my post about Cagney’s G-Men? https://silentlocations.wordpress.com/2015/05/09/the-three-on-a-match-g-men-ann-dvorak-connection/ It has views of the SP Depot too. The SP Depot also appears front and back in the Bebe Daniels silent comedy Ducks and Drakes, the silent drama Souls for Sale, and the Joe E. Brown Warner Bros. sound comedy Alibi Ike. The smaller Santa Fe station was probably easier to film at, and seems to appear more frequently in films.